The insurance industry is pouring billions of dollars into disruptive InsurTech development in the hopes of meeting rapidly changing customer expectations that have been moulded by the likes of Amazon, Apple, and Google. And, as these companies continue to change the game on how technology is used in e-commerce, the purchase and utilization of insurance will inevitably change along with it. The fact is, it must change, because the overall online experience is becoming as equally important to your customer as the value of the product or service. With billions being spent on InsurTech, it is obvious the entire insurance industry is in investment mode. But, what about the return on that investment? It is a common story. Build the best technology with the fanciest user interface and consumers will find their way to you and purchase. This used to work in the early days of digital. Now however, it requires a ton of effort around performance measurement, analytics, learning from failure and iterative builds. Only then, will you achieve the optimal user experience that results in growth to your business. When thinking about the user experience, you’ll need to take into account all aspects of the consumer journey, from consideration, evaluation and purchase during a sales process to billing and value-added offers as they become a policyholder. Generally, clients will pay more and retain longer if you service them with the best possible experience. Before you invest in the latest InsurTech, consider the framework and processes you need to have as part of any implementation to ensure success. The following five tactics will help you achieve your goals. The first thing you’ll want to do is define the measurements and objectives that indicate success. This will keep your team focused on solving your true business challenge. Knowing what success looks like is a key indicator the technology implemented is useful. It allows you to know when to celebrate success and when to learn from failure. To give you some ideas, here are some measurable metrics you might use as an insurance provider. Optimization testing or A/B testing your InsurTech is the most critical process you need to implement to ensure you achieve your goals. This applies regardless of whether your technology is used by your customer to drive sales and retention or used by your internal stakeholders to improve underwriting and service processes. In digital, there is always room for improvement when it comes to human-machine interaction. Even a small lift in the clickthrough rate can make a huge difference in achieving your goals. Here is an example. Go to Amazon and add a smartphone charger to your shopping cart. Then, abandon your cart and do the same thing the next day. Notice the difference in the experience? Amazon runs thousands of tests every day. They never waste their traffic and are continuously testing multiple versions of their user experience. This is the only way they know they have a great user experience. Increased clickthrough all the way to the goal of buying means Amazon has built a trustworthy frictionless site. They keep testing because digital demands human-machine interaction to be trustworthy and easy, and both are constantly changing in the world of smart hyper-connectivity. Bringing this back to the insurance industry, Kanetix.ca runs about two A/B tests a week. Try getting two car insurance quotes from the site one week apart. You will see differences in the creative and the user experience. Here is an example of how even subtle changes can make a difference. This test resulted in a 12 per cent lift in the number of phone calls for a chance to close on a new auto insurance policy. This was a huge win. In order to achieve the best numbers on lift, you need to track everything. Many insurance providers, and even technology providers to insurers, forget this process. Tracking all digital interactions is equally as important to any other activity in the technology implementation process. You can model any InsurTech like a funnel. Measure the clickthrough rate on each screen and understand why there is drop off. Drop off means friction or lack of confidence to move forward. Test new ways to interact with the user to better their experience thereby improving flow through the funnel. Below is a diagram that shows how clickthrough on each page can build a funnel model you can watch in real-time. 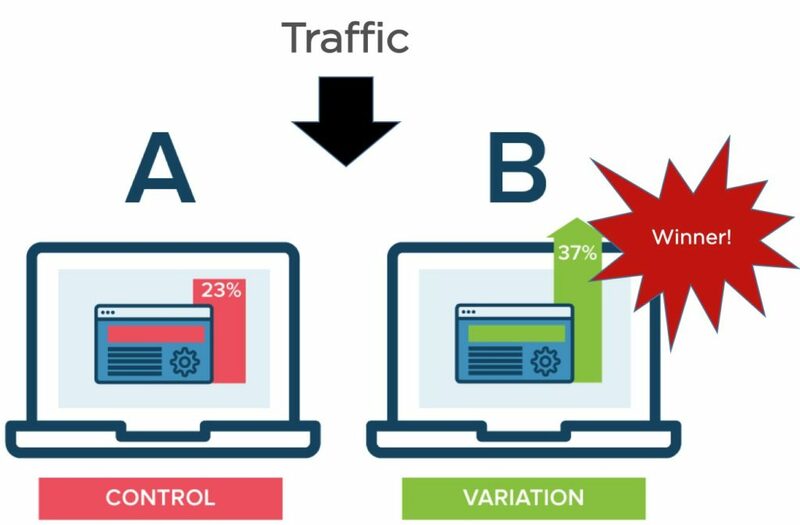 At first when you start A/B testing to optimize human-digital experience, you will have a lot of wins over your control model. If you have properly tracked everything, you will quickly get feedback, both positive and negative. That feedback will become your source for A/B test ideas. Ideally, you are setup to run two tests per week (100 tests per year). Pretty soon if you test quickly and make fast decisions driven by your data, your win rate will drop from 100 per cent to around 30 per cent. The analysts you want on your optimization team will be determined and steadfast to the testing process. That person is not afraid to fail and when they succeed, they will make fast decisions to scale the utilization of the new idea. 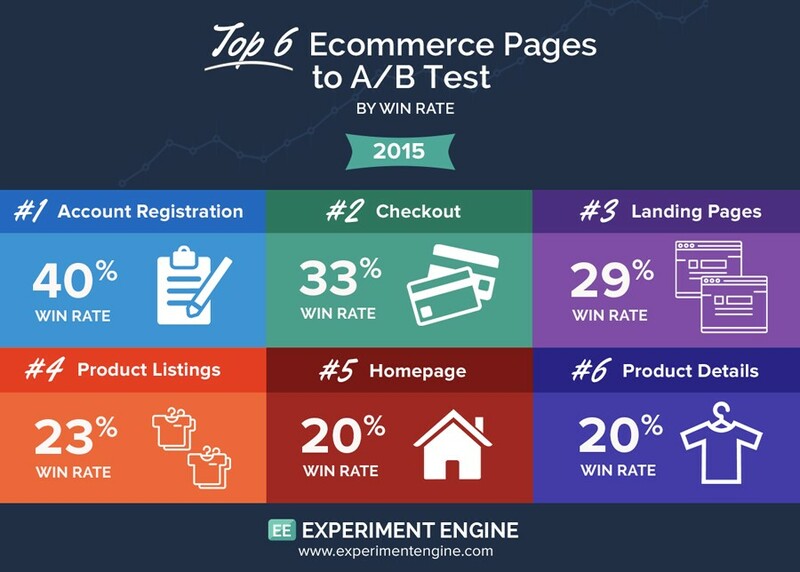 I found this infographic from Experiment Engine of typical win rates for e-commerce sites to help prioritize which pages to tackle first. Your testing will inspire process agility and fast paced implementation, and your learnings from optimization activities should be shared across the department or organization. Share both successes and failures at your monthly standup as it will create an open dialogue for new optimization ideas. Build a library of testable ideas. Run two tests a week or 100 tests per year. Track everything. Know when you win and when you lose. Scale the winners with more users or traffic. Share wins and losses across teams. Learnings mean better idea generation for future optimization tests.